I’m a traveling arborist from Sweden, I have been living and working in the UK for the past 10 years. I work as a contract tree climber in the UK and Sweden. I love doing climbing competitions – I travel around the world competing and sharing knowledge. I did not actively choose arboriculture, I see it more like arb chose me. I wanted to work within horticulture but during college, in Sweden, I did a work placement for an arb company in the UK. After I graduated I returned to the UK to do an apprenticeship, to learn English rather then arb, but I got hooked on arboriculture. I can’t image doing anything else! That is a tough one, I will have to pick two achievements. The first one, I was at a competition abroad a few years ago, where there was – many – male competitors, two females (in the Chapter Competitors) and me. During the announcements, I have no idea which women made it through to the masters as I couldn’t understand the language. I found out none had made it through. I asked why I was told that no women would be in the masters as their scores weren’t high enough. There wasn’t any time for me to climb as they let a guest male climber climb. I explained to them that’s not fair. I told them that male and female divisions should be separate and the top female should be allowed in masters. After they discussed, they turned around to me and told me that I could climb if I really wanted to. They were going to let me have a ‘glory run’ rather than letting the top female Chapter Competitor climb. I told them that if they going to let a female climber climb it should be the top female in the Chapter Competitors, not me. I don’t want to take someone else’s place in the finals, as this is the opportunity to advance and develop, and being eligible for future events. They had a long discussion and finally agreed to let the top Chapter Competitor climb rather than me. After they handed out the prizes, I brought it to their attention that there was no trophies and prizes for the female champion. The next again year I saw that the Chapter let the females into the masters and had a trophy for the women too, that felt like a big achievement. The second achievement is running and organising ‘Women’s Arb Camp’ for women within the profession. This year will be the fourth year running. During the weekend, we generally have a turnout of about 30 women participating. I think the best way is to show women in different roles in the profession, through advertising and show attendance staff. Also that there are support networks for women in different places like on Facebook and Instagram. 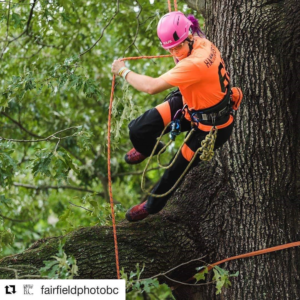 For example Women in Arboriculture Ontario (WAO) in Canada. We need to make women aware that this is a possible career path and there are many different roles within the profession. There is no reason we can’t get more women into arb. For example, almost 50% of the workforce in arb are women in Finland. Things like interviews, articles, and lectures to raise awareness that there are women in the profession and that there are many different ways women can be part of the profession and not just on the tools. Professional organisations should be trying to target a younger age group rather than those at college, maybe even as young as primary school, to show that this is ‘a thing’. By being open with the struggles and experiences that we face within the profession, sharing experiences and stories of how we got through things. We need to support people as individuals and not finding one way that all women can be supported. Being able to ask for support and knowing that you have somewhere to turn to get advice as well as being able to vent. By showing that this is a fun and challenging profession that requires more problem-solving skills and techniques then raw muscle and brute strength. Some days or jobs might be more of a challenge than others due to different reasons but not all days are like that! There are highs and lows with any profession but it’s still worth doing.